An Eton design, known for technical sound, very high-quality drivers, fast, with German engineering. To learn more tap image. A two-way kit Madisound is producing. Each cabinet is hand made, including veneering. Among the most remarkable drivers money can buy, sound quality at its very best. Combined with the cabinets we build, one can expect not only high-end furniture-grade woodwork, but sound that is precise, deep bass, and a magical stage. A SEAS design, monitor with paper cone woofer and silk tweeter. Front ported. Paper, simply stated, is a material famous for musicality. The kit can be purchased from Madisound for a very fair price. In sapelli veneer. A tower design with some of the finest SEAS drivers. Can be built as a monitor or a tower. Woven polypropylene woofers with metal dome tweeters. The cabinet shown has sapelli veneer. Cherry veneer. A very popular kit with ScanSpeak drivers. 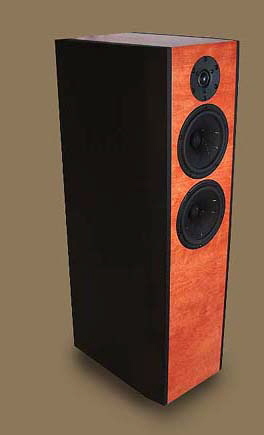 A well designed tower with twin ports, well braced, a handmade heavy tower for exceptional sound. 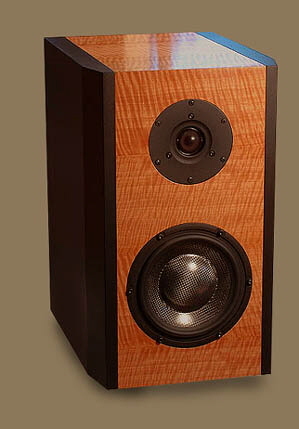 The same drivers as the Zaph 2.5, but in a two-way configuration, shown in cherry veneer. Can be produced as a monitor or tower. Some of the most remarkable drivers money can buy, sound quality at its very best are combined with the cabinets we build. One can expect not only high-end furniture-grade woodwork, but also sound that is precise, deep bass, and a magical stage. A Morel design, monitor with carbon-fiber woofer and silk tweeter. Many feel the sound is remarkable. A favorite at Madisound. The kit can be purchased from Madisound for a very fair price. For over 20 years we have been building speaker enclosures for speaker companies, kit builders, experimenters, and designers. We use veneer presses for veneering, never paper backed or contact cement. Our finishing facilities and extensive shop capabilities create the very finest quality work. Each detail, from cutting in drivers, bracing and veneering to joinery is “drop dead gorgeous” (Stereophile). Customers’ frequent responses are, “Your work is amazing! I’m shocked, astonished and delighted”. Below are the standard kit cabinets we offer as well as a link to custom work. Be sure to tap the photos to learn more about each kit.